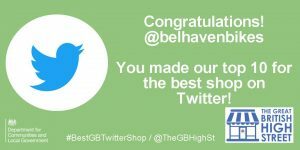 You are here: Home » News » Belhaven Bikes makes ‘Twitter Top Ten’! Belhaven Bikes makes ‘Twitter Top Ten’! Leading on from previous UK awards, we were delighted to learn that we made ‘The Great British High Street of the Year Awards’ Top Ten Best Shops on Twitter. We were nominated by our customers and the judges, Twitter UK and the UK Government’s Department for Communities and Local Government, awarded us a Top Ten placing in this digital category. “Twitter allows us to continue our community, social hub online. whether that be ours or from others, and it’s a great social atmosphere. and check out the stock at the same time. 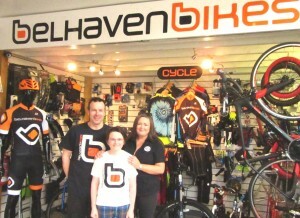 Belhaven Bikes are very active and supportive of the local community”.